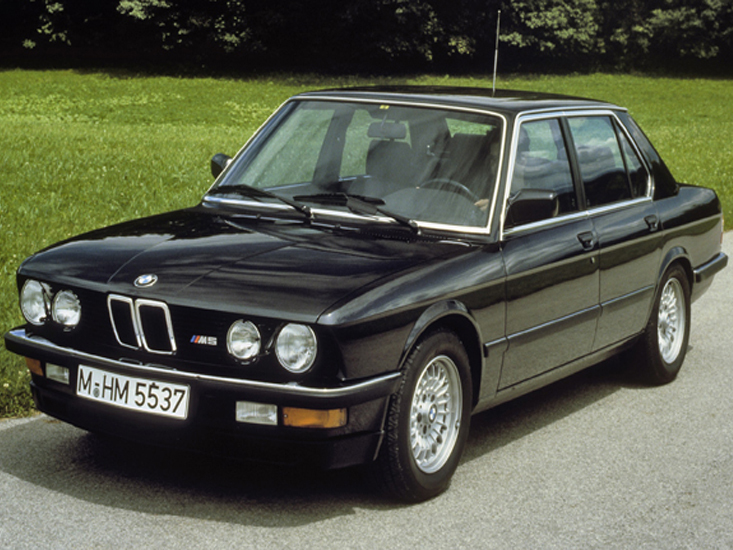 The first BMW M5, based on the E28 5 Series, made its debut at Amsterdam Motor Show in February 1984. It was the product of demand for an automobile with the carrying capacity of a saloon (sedan), but the overall performance of a sports car. It utilized the 535i chassis and an evolution of the engine from the BMW M1. 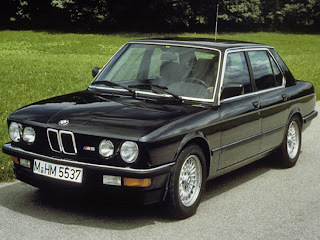 At its launch, the E28 M5 was the fastest production sedan in the world. The first generation M5 was hand-built in Preußenstrasse/Munich prior to the 1986 Motorsport factory summer vacation. Thereafter, M5 production was moved to Daimlerstraße in Garching where the remainder were built by hand. Production of the M5 continued until November 1988, well after production of the E28 chassis ended in Germany in December 1987. This continued production would eventually lead to a class action lawsuit that was settled with vouchers being given to car owners. Chicago Clearing Corporation served as a market maker for this $4,000 vouchers that were officially issued in 1993. The M5 was produced in four different versions based on intended export locations. These were the left-hand drive (LHD) Euro spec, the right-hand drive (RHD) UK spec, the LHD North American (NA) spec for the United States and Canada, and the RHD South African (ZA) spec. The European and South African M5s used the M88/3 engine which produced 286 PS (210 kW; 282 hp). North American 1988 models used the S38B35 engine which was equipped with a catalytic converter and produced 256 hp (191 kW). Production of North American specification M5s commenced in November 1986 and ended in November 1987. Aside from 96 cars which were assembled in kit form at BMW's Plant in Rosslyn, South Africa, all E28 M5s were assembled by hand at BMW Motorsport in Garching, Germany. With a total production of 2,191 units, the E28 M5 remains among the rarest regular production BMW Motorsport cars – after the BMW M1 (456 units), BMW E34 M5 Touring (891 units), and the BMW 850CSi (1510 units). European models European-Spec M5s were available with some options unavailable on USA-Spec M5s, such as Water Buffalo leather and a Glass Moonroof. Left-hand rive (LHD) cars were equipped with 185TR390 metric wheels, while right-hand drive (RHD) cars used 16x7.5 wheels. 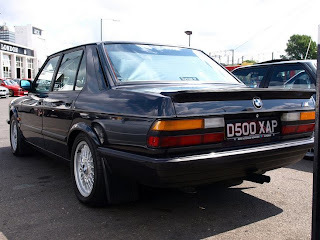 Very early European-Spec LHD M5s had VINs that started with "WBA" instead of the "WBS" designation to indicate BMW Motorsport. it is estimated that no more than 15 M5s were produced with a "WBA" VIN. USA/Canada models US-Specification M5s were comprehensively optioned: Leather Door Panels, Leather Center Console, Full Trunk Carpeting, Air Conditioning, Power Windows, Power Sunroof, Power Seats, Cruise Control, On-Board Computer, Central Locking and Shadowline Trim were standard. The only option on a US-Specification M5 was electrically heated front seats which were standard equipment on Canadian-Market cars. The only paint colour available was "jet black". Last updated on 16 August 2013 at 09:37.